One of those examples was the 2015 general election, which forms one of the nine chapters in the book. As background, here is I think the best illustration of how poor the UK recovery from the 2009 recession was (from The Resolution Foundation). As we can clearly see, the post-2009 recovery was slower than anything we have seen in the last 100 years. Now sometimes governments can be unlucky, as the economy follows events that they cannot control, but the recovery after the Global Financial Crisis was not like that. 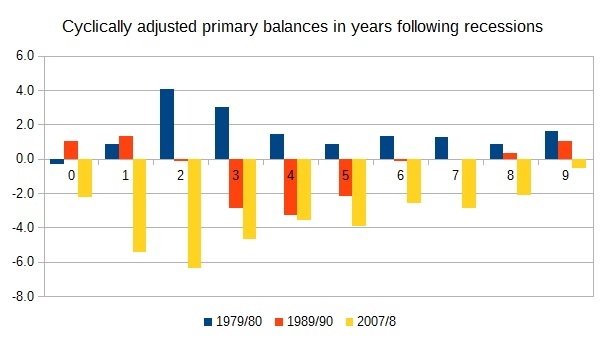 In this chart, using OBR data, I compare the cyclically adjusted primary balance during the last three recessions. Take the ‘ERM recession’ first. Fiscal policy did very little until 1992, when both fiscal and monetary policy became expansionary, leading to a strong subsequent recovery. (Fiscal policy moving in a downward direction is expansionary and vice versa.) This is a classic expansion, with both fiscal and monetary policy providing a stimulus together. The ‘monetarist recession’ is more complex. During 1982 interest rates were reduced steadily from nearly 15% to 10%, but famously the April 1981 budget led to a sharp fiscal tightening (leading to the famous 364 economists’ letter). 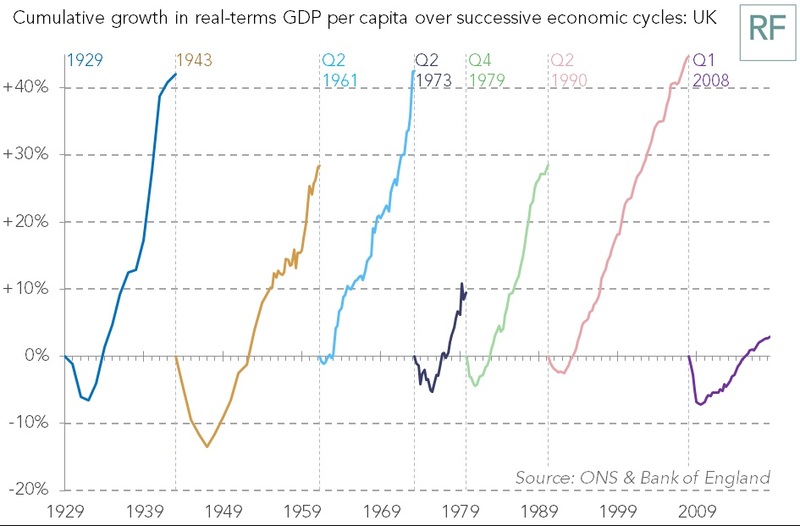 Contrary to right wing and media myth, the economy’s response to this contradictory mix was to grow at around the trend growth rate, so not a true recovery (by which I mean growth above trend, so we catch up with that trend). 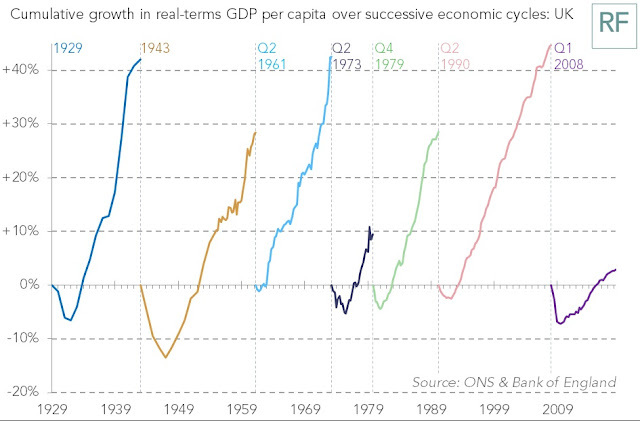 We only got a true recovery from 1983, when fiscal policy relaxed alongside monetary policy. This is textbook stuff (hence the 364 letter). In early 2009 UK interest rates hit their lower bound, so fiscal expansion was needed more than ever, and that is what happened under Labour. But the Conservatives bought the myth about 1981, carefully cultivated by the Institute of Economic Affairs and swallowed by the media, that the 364 economists had been wrong, so in opposition they opposed the 2008/9 and 2009/10 expansion and in government started a fiscal contraction, a contraction that only came to an end in 2017. 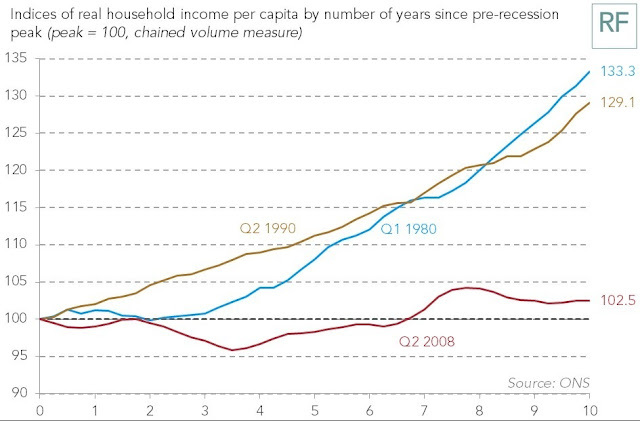 The inevitable consequence was the weakest recovery for a 100 years. Combining a weak recovery with a large 2008 depreciation of sterling meant incomes literally stagnated for 7 years, as another chart from the Resolution Foundation shows. The Conservatives did not admit their mistake and pledge not to do it again, but preferred to create a false narrative instead. The lie was the story of a profligate Labour government and how the Coalition government had been forced to clear up the mess. Voters bought it. Coming into the 2015 general election, polls suggested the economy was the Conservatives' strong point. They did so in part because the media never challenged the story, which was obviously false from just a brief inspection of the data. Rather than look at the data they preferred to talk to City economists (and not academics), and most City economists have an interest in backing a Conservative line and talking up the power and threat from the market. In that sense the media played a key role in winning the 2015 election for Cameron, which of course was the only way a referendum could happen. Evidence to back up all this is in the book. The Conservative party has never acknowledged their austerity error, and so we have every reason to think they would do the same again if another recession came along. Much of the media still prefer to let politicians make any nonsense economic claim they wish, and they rely on other politicians to challenge them rather than confront them with the facts or expert consensus. The Ashcroft poll at Conservative Home (Lord Ashcroft: The Two Divides – Austerity, Brexit and the problem of building a winning coalition, September 30 2018) shows on the fifth graph from the top that the only statement in which the Conservatives have a big lead over Labour is 'willing to take tough decisions for the long term'. I have just searched the Tory manifesto for the 2015 election, and there are sixteen mentions of 'long-term economic plan'. We know the Tories changed from economic plan A to plan B in 2012 and that the BBC chose to cover this up. So this is the lying core of Thatcherism, and as such the current crisis follows on from the start of Thatcherism and TINA. If the Labour Party is to overthrow Thatcherism this is the public perception it needs to efface. A genuine question. Paul Krugman has drawn things like this but included international comparisons. I'd be interested in seeing this in these analyses. Not because I disagree with your thesis, rather because it would go to show that alternatives have been tried and succeeded for this crisis. The reason I ask is I am aware (I am not an economist) that there is / was a view that banking driven busts (as opposed to what we had in 90) are always much slower in recovery even with the right policy. I had to turn off the TV sound when LibDem Danny Alexander came on a news program with the 'mess that Labour left us' phrase. For me that damned the LibDems in coalition with the Conservatives. If politics is not honest, we are lost. Hello, thanks for yet another informative post. I am sorry if I am being thick, but what do the letters Q mean in the diagrams? Have bought the book and look forward to reading it. Thank you for your blog which is great! Thank you for another excellent presentation of this issue. Just on the diagrams - the first and third are very clear. But the second is not obvious and is therefore likely to generate some confusion - one has to work quite hard to translate levels into changes. I suggest that it also raises a greater difficulty - it lends support to the media story that the last Labour government was profligate, because the deficit at the start of the crisis contrasts with the surpluses in the other two cases. There is still no easy answer to the charge that the IMF said at the time that the deficit was too large and in some sense structurally unsound. Getting the reply to that right is a big part of convincing people of the anti-austerity story. I suspect that the problem may be a bit deeper than ‘the media doesn’t interview macroeconomists’. Much of the public is probably resigned about the deficit, because they know that sooner or later it has to be reduced, and on the backs of the ordinary taxpayer rather than the rich and powerful. How sensitive will they be to arguments that deficit reduction could have been slower in a couple of years, when they know that it’s a long haul anyway? And such an argument would not address the deep resentment arising from the perception that the deficit is basically a bailout of bankers and nothing to do with making the economy work better. For that, politicians of both main parties are blamed, but especially the one in power when the crisis broke. In that scenario, the real villains of the piece were the Liberals supporting austerity in the coalition government, who under Charles Kennedy had been the refuge of those disillusioned with new Labour.